End of an era… sort of. Jo Rivera's fiancée Vee Torres just confirmed that this will be her last season of Teen Mom 2. The brunette beauty made the announcement on Twitter — and seemingly hinted the drama was the reason for her departure. "It’s my last season and I won’t be on much this one either," the makeup artist wrote. In a separate tweet, she added, "Energy is contagious, positive and negative alike. I will forever be mindful of what and who I am allowing into my space. I won’t be dealing with it and I won’t have my daughter around it either!" It is yet unknown if Jo will also be leaving the MTV series. However, now Vee, who shares daughter Vivi with Jo, can focus on her wedding, which she previously announced will not take place on national television either. "I don’t want it documented lol,” Vee explained. "That’s why I said no. It’ll be between family and friends how we want it." It's no surprise Vee wants to leave Teen Mom — especially given the amount of drama between Jo's ex Kailyn Lowry, Briana DeJesus, and Jenelle Evans this past season. Kail just accused Briana of breaking girl code when she started dating her ex-husband Javi Marroquin behind her back. 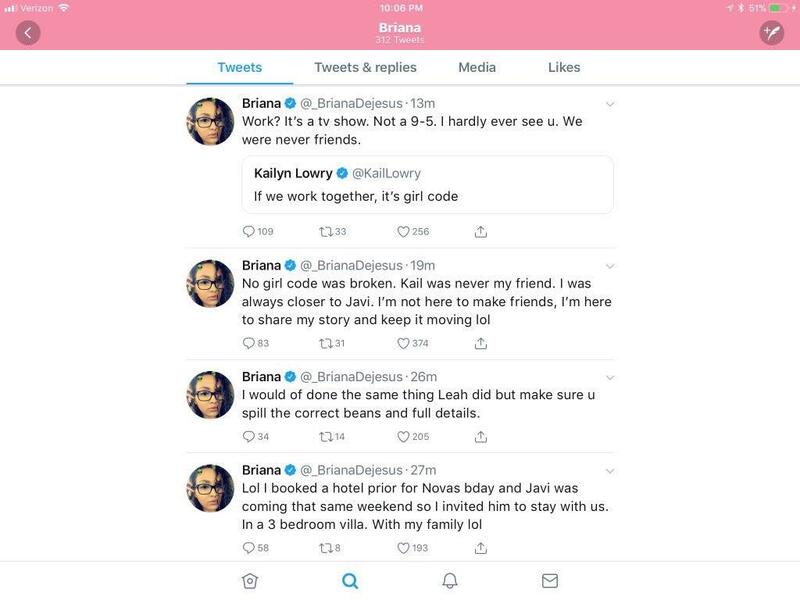 "No girl code was broken," Bri wrote on Twitter before deleting the tweets. "Kail was never my friend. I was always closer to Javi. I'm not here to make friends, I'm here to share my story and keep it moving." Kail has also had beef with Jenelle for years, including that one time Jenelle sent her co-stars ceast-and-desist letters, requiring that they stop mentioning her on social media. More recently, Jenelle hinted Chris Lopez isn't the father of Kailyn's youngest son Lux — prompting Kail to have a mini-breakdown on the Teen Mom reunion. "I don't want to be around Briana. I don't want to be around Jenelle. I don't want to be around Javi," she said in the preview clip. "I don't like Briana, I don't like Jenelle, I don't want to be around them." You'll be missed Vee. Love Teen Mom? Be sure to join our Teen Mom Facebook group to chat about all the latest updates and juicy gossip!